IW synchronized skating teams the Wight Jewels and Wight Crystals travelled to Birmingham’s Leisurebox ice rink for a development day on 21 August, along with teams from Solihull. 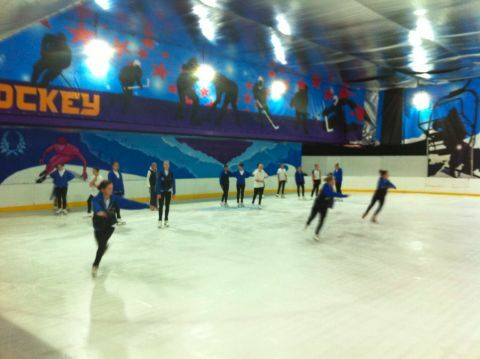 The trip allowed the IW teams to practice on a slightly bigger ice pad than at Ryde (54 x 24 metres compared with 44 x 22 metres), and to have the new elements for the forthcoming season’s programmes assessed. The Wight Jewels remain at junior level for the coming season; the Wight Crystals have moved up to novice level, swelling the team size to 16. Both teams received certificates of merit for their wheels. Birmingham’s Leisurebox rink has historic associations: it was the home rink for Olympic figure skating gold medallist John Curry, as well as for Olympic speed skating gold medallist Wilf O’Reilly. The former Silver Blades and Planet Ice rink was closed after a fire in 2003, but reopened in 2010 as The Leisurebox.